This Wednesday we're releasing 3 new pilot beers we tested in preparation of upcoming commercial sized batches. We wanted to get a feel for the ingredients and determine the appropriate yeast for the exact beers we were looking for. To start things off, at 5pm we're releasing our Smoked Roggenbier. This is a German medieval style of beer with equal parts pale malt and rye. We also added a touch of smoked malt that adds to the aroma and flavor of the beer. We targeted a medium body for this recipe with spicy notes from the rye malt. 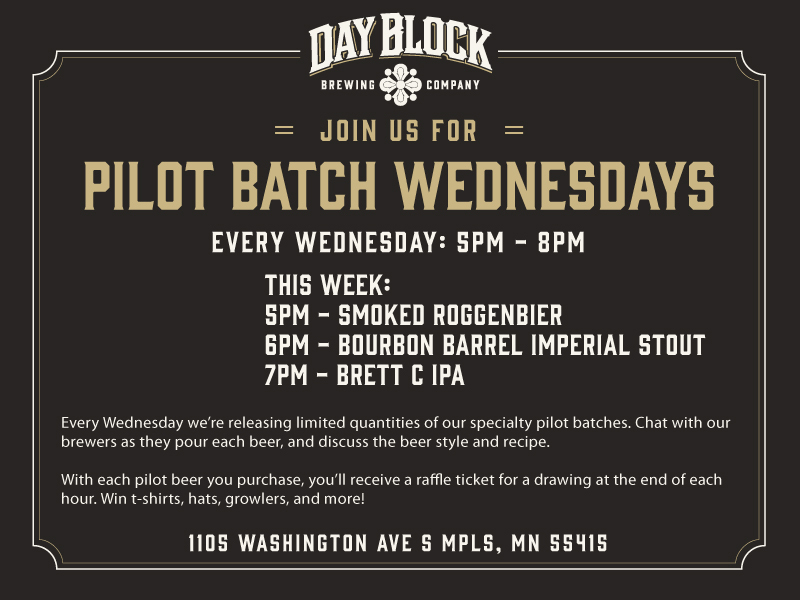 At 6pm we're bringing back a previous pilot batch, this time aged for a few weeks on bourbon soaked oak spirals. Expect this beer to be full-bodied and bursting with dark roast and bourbon character. A favorite deep-winter style, our Imperial Stout will be brewed on our 10 BBL system this fall. Finally, at 7pm we're releasing another Brettanomyces IPA, this time with Brett C (claussenii) which will give a slightly fruity characteristic to the beer. This was a favorite at a previous Pilot Batch Wednesday, and we think this Brettanomyces strain is among the best!